The Thunderbird Lodge and the Thunderbird yacht are two important pieces of North Lake Tahoe's history. The lakefront lodge is in a secluded area with tours of the home and property offered from Tuesday to Saturday starting from mid-May to mid-October. George Whittell Jr., or commonly called as “Captain” in his time, is the man behind the construction of the Thunderbird Lodge on the shores Lake Tahoe. 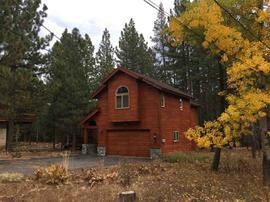 At that time, Whittell owned around 40,000 acres with 20 miles of Tahoe lakefrontage. Initially, he had plans to develop the property into high-end summer homes. He also had a million-dollar casino and a ski resort in mind. However, these plans didn’t come into fruition because he developed an interest in animal and nature preservation. As a result, most of his Lake Tahoe properties were untouched until his death in 1969. Dreyfus Investments acquired 10,000 acres of Whittell’s property by the efforts of Jack Dreyfus. He then sold most of it to Nevada State Parks and the Forest Service. In 1985, Dreyfus added new buildings to the lodge. The structures added to the lodge’s original design included an entertainment room connected to the existing lighthouse, a 2-storey wing on top of the garage deck, and an enclosed glass bridge connecting both. The design theme of the home was retained so renovations would look like they were part of the original property as it was first built. 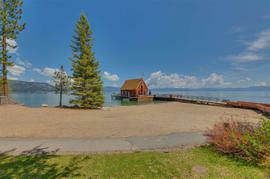 Lake Tahoe was one of the prime locations for prominent families in San Francisco to build their lakefront homes. The Thunderbird Lodge for example is a great residential estate worthy of being called an upper class society dwelling. Apart from the main house, there was the Gate House, a Butler’s House, Card House, Caretaker’s Cottage, the Admiral’s House, and an elephant barn. The boat house in particular is a sight to see with the adjoining 600 feet tunnel. In terms of design, the Thunderbird Lodge was built to match the surroundings of North Lake Tahoe. All aspects of the construction as well as the interior we’re based on this philosophy. All materials, setting, landscape and design we’re highly personalized presenting a high level of architectural masterpiece in its day. The Thunderbird Lodge is undoubtedly one of the amazing sites to behold in Lake Tahoe. It shows high-expertise building crafts, metal work, stone masonry and wood work. These features are evident throughout the house and structures, as well as the walkways and other design elements of the entire estate. All of this is from the genius mind of Nevada’s most esteemed architect in his era, Frederic J. DeLongchamps. The natural landscape of the lakeside estate was filled with a heavy forest of mixed conifers sloping towards the shoreline. This panoramic view is a sight to behold together with the surrounding mountain ranges of Mount Rose Wilderness and Desolation Wilderness. The Tahoe shoreline is a wonder with a mix of granite boulders and sand. By 1998, the Whittell Estate with its 140 acres of land was bought by Del Webb Corporation. Del Webb was a successful developer with over 50 active lifestyle communities. The following year, a three way exchange was conducted facilitated by the American Land Conservancy. Del Webb received 4000 acres of Clark County land from the US Bureau of Land Management while US Forest Service got hold of the 140-acre estate. However, the Forest Service did not want to acquire the estate. This resulted in the formation of the non-profit Thunderbird Lodge Preservation Society affiliated with the University of Nevada, Reno. The Whittell estate at Lake Tahoe was conveyed to the Preservation Society together with a $9.8 million note payable to Del Webb. In 2000, North Lake Tahoe's Thunderbird Lodge was officially added to the National Register of Historic Places. In 2003, the estate was acquired by Pulte Homes together with the note. The University of Nevada, Reno also disassociated itself from the Preservation Society. In 2009, a capital fundraising campaign for the $9.8 million note was conducted and received generous help from the Donald W. Reynolds Foundation and Pulte Homes. This allowed the North Lake Tahoe Preservation Society to settle its debts and acquire the title to the Thunderbird Lodge. Robert Montgomery Watson built a Gatekeeper’s Cabin on the North Shore of Lake Tahoe in the late 1900’s. However, the building was totally destroyed by arson in 1980. A reconstruction project was conducted resulting in the Gatekeeper’s Museum we know today. Sir Watson was also the builder of the famed Watson Cabin. He built the Gatekeeper’s Cabin as a home for the Trucke River Watermaster of the time – the person responsible for controlling the flow of water out of Lake Tahoe. The new structure is turned into a museum showcasing Lake Tahoe history. It covers an expansive timeline from the Washoe people, the logging and mining eras, up to the current tourism industry in Lake Tahoe. There are numerous exhibits including Native American handmade baskets, historical photographs, ancient clothing, maps, archival documents, artifacts, oral histories and resort memorabilia. One interesting section in the museum is the resource library. It's open to the public and allows you to access historical documents for research and educational purposes. You are also allowed to request for copies of historical photographs by simply placing an order in the museum. Some of the noted highlights of the Gatekeeper’s Museum collection are the 1916 Lake Tahoe Photographic Shore Line Survey Exhibit, works from Dat-so-la-lee and other famous Washoe weavers, and 1960 Olympics and skiing exhibits. There is also a good amount of Washoe history memorabilia as well as current Lake Tahoe Resorts souvenirs. Vikingsholm Castle is a piece of unique architecture situated in Lake Tahoe’s Emerald Bay. 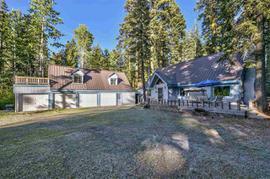 It is a magnificent lakefront home surrounded by majestic towering cedars and pines. The castle was the summer home of a Californian socialite named Mrs. Lora Josephine Knight built in 1929. As one of Lake Tahoe’s summer residences, Vikingsholm Castle is also full of history. The land where it was built originally belonged to a man named Ben Holiday. He was a stagecoach magnate and has commissioned a home on the property in the late 1860’s. In 1880, the land was bought by Paul Kirby and was converted to a lakefront resort with several cabins. Over a decade later, the property was bought by William Henry Armstrong in 1892. The family used the cabins as their summer home for over three decades. In the early 1900’s, Mrs. Knight was able to acquire the property and had a new residential home in mind. The construction of the Vikingsholm Castle was inspired by Mrs. Knight’s love for the land. She fell in love with Emerald Bay because it reminded her of the fjords she saw during her trips to Scandinavia. She had a Swedish architect named Lennart Palme – a nephew by marriage – design a summer mansion. Upon its completion, Mrs. Knight has held many parties over the course of 15 summers until her death in 1945. The lakefront estate was then bought by a rancher from Nevada named Lawrence Holland. Subsequently, he sold it to a lumberman Harvey West. Mr. West was a notable philanthropist in the early 1950’s and intended to sell the lakefront estate to the State of California. As an agreement, he was able to get half the appraised value of the property as payment and donated the other half to the state. The Vikingsholm estate became the official property of the State of California in 1953. Lake Tahoe's Vikingsholm Castle stands as a beautiful example of Scandinavian architecture in the US. It is currently a part of Emerald Bay State Park’s Harvey West Unit. The house is open for public tours during the summer while the outdoor areas are open for everyone to enjoy all year round. Many assumed that Mrs. Knight was of Scandinavian descent due to the architectural design of her summer home – the Vikingsholm Castle. However, she was actually of English origin and was born in 1964 as Lora Josephine Small. Her birthplace was in Galena, Illinois and has lived with her parents and four siblings. Lora’s father was a corporate lawyer. He had taken in two young brothers namely James and William Moore as apprentices to the firm. Eventually the brothers managed to influence a number of reputed companies like the Continental Dan, Union Pacific, National Biscuit, Diamond Match and the Rock Island Railroad. In the 1880s the brothers married two of the Small daughters with Lora married to James Moore. The couple had one son named Nathaniel, who at his prime married into the Wells Fargo family. James and Lora spent many of their married years in Chicago and Lake Geneva. They had a passion for travelling and made many trips to California and abroad. In 1915, they acquired a house in Santa Barbara. However, the happiness in the new home was short lived as Mr. Moore died in 1916. Lora or Mrs. Knight is well known as the origional owner of the Vikingsholm Castle, but she had other equally magnificent contributions to society as a philanthropist. She was involved in many youth groups in California and Nevada. She sponsored numerous scholarships for the young as well as became a major benefactor to Christian Science churches in South Lake Tahoe, Santa Barbara, and Reno. She and her second husband commissioned the flight of Charles Lindbergh across the Atlantic as well. Donner Memorial State Park is a modern addition to the beautiful landscapes of Sierra Nevada. It is a great place for summer activities like camping, boating, picnicking, hiking, water skiing, and even fishing. During winter, the place is ideal for cross country skiing. The facility includes the Donner Memorial State Park Visitor Center and features various historical exhibits including Washoe people, emigrant experience, the Donner Party and even the Chinese railroad construction. The park area spans from the Schallenberger Ridge towards the south of Donner Lake. This vast area presents many of Sierra Nevada’s geological history. There is also the Pioneer Monument – a structure built to commemorate emigrants from the east in the mid 1800’s. It has stood strong against time for more than 99 years. During its dedication on June 6, 1918, thousands of people honored the past together with three Donner Party survivors. In June 9, 2018, a rededication and centennial celebration will be held for the iconic statue. Ceremonies will begin at 11am followed by numerous activities. There will also be a fundraising Gala for an additional educational pavilion and the restoration of the monument. The Hellman-Ehrman Mansion is strategically located in Sugar Pine Point State Park – an established facility on the West Shore of Lake Tahoe. A San Francisco businessman I.W. Hellman started buying properties at Sugar Pine Point in 1897. By 1913, he was able to acquire nearly 2000 acres on Lake Tahoe. During his hunt for new properties, he also had a summer home constructed called Pine Lodge. The simple but grand house was completed in 1903 and was considered a fine addition to the high society estates in the Sierras. The lakefront home was then inherited by his daughter, Florence Hellman Ehrman. She and her husband Sydney spent numerous summers hosting family gatherings and friendly visits on the shores of Lake Tahoe. The site for the lodge was formerly a sand hill. In order to establish a good foundation for the structure, tons of topsoil was imported. This was also used for the lakefront lawns and the gardens surrounding the lodge. The lodge in itself was made from local materials such as Meeks Bay granite and Hobart Mills lumber. The designer for the lakefront home was Walter Danforth Bliss. He was able to use modern utility systems for the design including electric lights, indoor plumbing and steam generators. Water for the estate was taken from the General Creek until they opted to pump water directly from Lake Tahoe. Aside from the main house, there is also a caretaker’s cottage near the lake shore. Nearby is the children’s house located next to the tennis court. Additional structures include the maids’ quarters, butler’s cabin, coach house, ice house, power house, the dressing room and the water pump house. The Ehrmans had two beloved boats named Comet and Cherokee – which were docked in their own boat houses next to the boatman’s cabin. Upon entering the house, you will find comfortable wicker furniture and a billiard table. There is a north stone room furnished with antique oak dining set meant for luncheons. The south stone room on the other hand was mainly a game room. It was used to display the Ehrmans’ Navajo rugs and Indian basket collection. The main heat source for the mansion is the living room fireplace. The room has dark, overstuffed furniture with floral drapes. The intricate paneling was made of hand-woven redwood strips. The upper paneling of the drapes was made from hand-woven grass. Although installed later in 1958, there was an elevator to provide convenient access to the second floor. Northwest of the house is the area for the kitchen, pantry and dining room for the staff. The family had two full-time cooks and several helpers for food preparation. The lakefront property was always busy with the family, their occasional guests and twenty seven live-in staff. Initially, all meals were prepared using wood stoves. However, the kitchen was upgraded in 1945 with a new refrigerator and commercial gas range. The second floor mainly consisted of guest rooms. From the spiral staircase, a wide hall will greet visitors leading to the eight bedrooms and seven bathrooms of the house. The bedrooms were simply furnished with brass beds and native rugs. The third floor was accessed thru a back staircase from the kitchen wing. The third floor was used as staff quarters with one bathroom, four bedrooms and several storage closets. The Ehrmans loved to entertain their guests with various activities. Mrs. Ehrman in particular liked to organize hikes, riding, boating, fishing, picnicking, and swimming. By 1965, the entire 1975-acre lakefront estate was bought by the California State Park System. At present, the house is used as a museum representing the opulence of Lake Tahoe summer houses. This expansive facility was created to preserve and showcase Sierra’s glorious ski heritage. The museum gives a tour down memory lane from the beginnings of the tradition towards the 1960 Olympic Winter Games. The games commenced in February 1960 in California’s Sierra Nevada Mountain Ranges in North Lake Tahoe. 665 athletes from 30 countries worldwide gathered to compete with each other. There were five Olympic winter sports divided into 27 events that lasted for 11 days. The events included alpine skiing, cross-country skiing, Nordic combined, biathlon, speed skating, ski jumping, figure skating and ice hockey. You will find a detailed chronicle of the historic events at Lake Tahoe and Squaw Valley in a book titled “Snowball’s Chance: The Story of the 1960 Olympic Winter Games”. Actual accounts of all events including information of the top scores and rankings are recorded in the book. A vivid description of the extensive pageantry of the ceremonies planned and conducted by Walt Disney is also transcribed. The 200 book pages include over 80 official photographs by Bill Briner and some others showing the venues and athletes. Snowball’s Chance won the ULLR Award 2009 given by the International Ski History Association for being a written evidence of the wonderful ski history of the time.